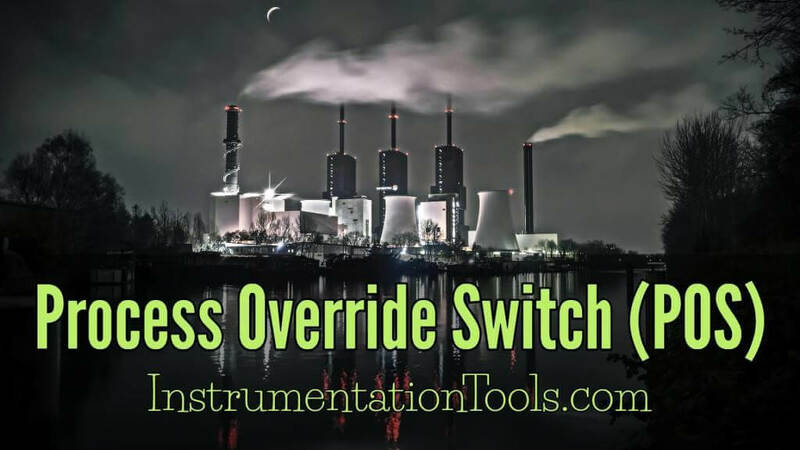 Home » What is Process Override Switch (POS) ? Process Override Switch shall be provided to override unhealthy field inputs in order to facilitate start-up, which shall automatically be released upon normalisation of the field input or preset time, whichever is earlier. In case the process condition has not normalized within the preset-time, it shall result in start failure, and accordingly abort the start-up, or shutdown the equipment, as the case may be. Next start attempt shall be enabled only after resetting the system manually. While the timer is running, the overriden input shall not prevent reset of the logic, however the alarm status of the field inputs, which are overridden by POS, shall not be masked. When the process is in normal operating condition, activation of POS shall be inhibited programmatically. The tag number of the field device in “Red” foreground flickering as long as alarm persists. The tag number shall be shrouded in a magenta box as long as the POS is active. All the above requirements shall be provided irrespective of the system used viz. PLC or relay based. a) POS shall be software switches in the ESD/ SSLS logic except where specifically indicated in the P&ID. Access to POS preset time setting shall be password protected. b) Activation and release of POS shall be logged into the alarm journals of the ESD / SSLS workstation and displayed graphically. a) POS shall be pulse initiated by spring return key switches on the ESD operator fascia. b) Activation and release of POS shall be logged into the alarm journals of the DCS. c) The status indicating lamps of appropriate colour shall be provided in the operator panel.